Good friend Dimitris Dimitriadis (@insideabox) was writing about his use of self-tracking apps. I would like to explore this a bit further, in an effort to provide more insight on the purpose of the quantified self excerice. 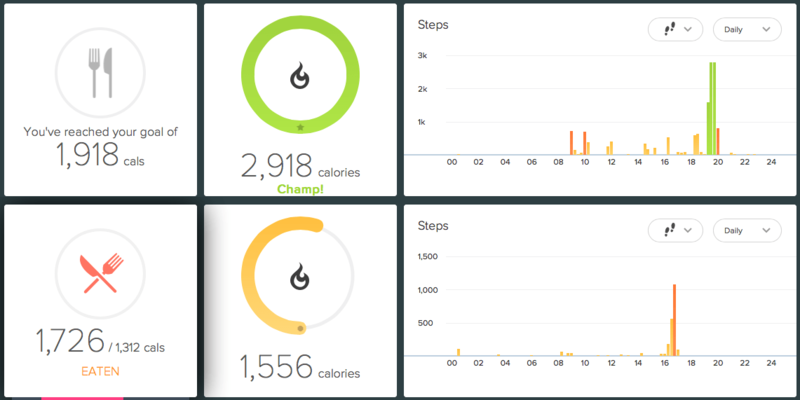 An active vs non-active day on Fitbit. The level of activity determines my calorie goal, in real time. Weight loss/gain: If weight loss (or gain) is a goal, just being more active and counting steps usually wont equal success. The human mind isn’t that good about realising if you’re actually hungry or not. Tiredness, temperature, hydration will affect your “appetite”. So, my suggestion would be to do food tracking through the Fitbit* app itself or MyFitnessPal (it syncs back to Fitbit). The result is a during-the-day feedback cycle on whether you can “afford” to eat or not (or need to step up in order to burn extra calories ;)). Productivity: RescueTime does an excellent job of giving you a view into where you spent your time (on you computer and Android phone). But it really becomes a powerful tool in the premium version. You can better track goals like “more than X hours of productive time” or “less than Y hours of social media time”, receiving alerts through out your day (again a case of real-time feedback), as well as automatically triggering “focus sessions”. For example, I’ve set RT so that after a total of 30 mins of social networking, RT will start a focus session blocking all distractive sites. 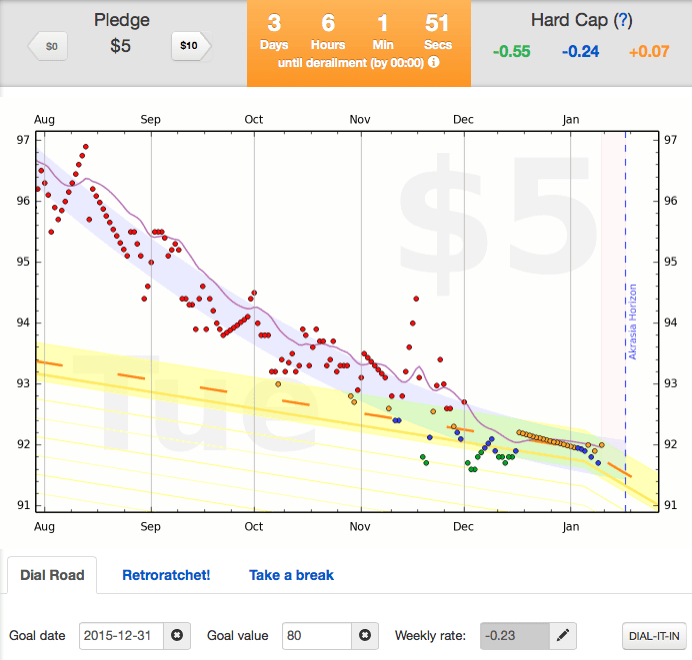 Goal setting with a sting: Beeminder provides excellent insight on whether you’re on track for your goals. Additionally, you can optionally pledge some money towards your goal keep you focused. Goal setting: The last few days I’ve started using Beeminder (free with premium subscriptions for advanced users) and I’m loving it: it takes your tracking numbers (e.g. steps or productivity), your initially set goals (X number of steps per week, X number of productive hours) and gives you real time (truly the “magic phrase” for me) feedback on whether you’re on track to achieve them. You can have either automatically-fed goals (data coming form Fitbit, RunKeeper, RescueTime plus tons of other services through Zapier) or simply custom goals which you manually enter data yourself. 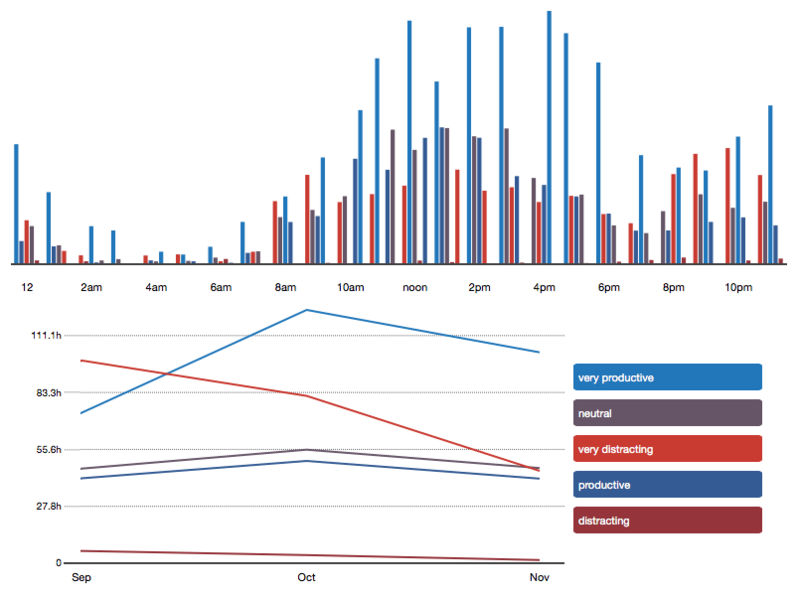 Analysis: A recent find of mine is Zenobase, a powerful service allowing to import data from various sources (from Foursquare to Fitbit to RescueTime to just your own Excel file), visualise them and do your own correlations (location vs sleep time or running pace vs productivity or whatever crazy thing you can think of. This entry was posted on Saturday, January 17th, 2015 at 11:15 am	and is filed under Productivity, Technology.